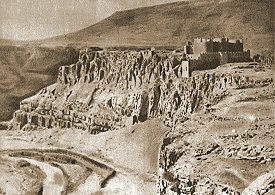 The fortress of Magazberd is situated on a rocky outcrop above a bend in the Akhurian river, about four kilometres to the south-west of Ani. 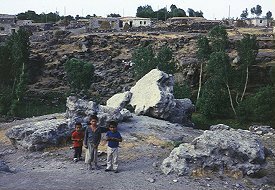 There may have been a castle here as far back as the 6th century - or earlier - but the bulk of the present structure probably dates from the time of the kingdom of Ani. 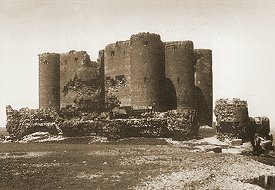 At the end of the 12th century, after the Georgians had expelled the Muslim rulers of Ani, Magazberd and other fortresses formed a protective ring around Ani. To the north of Ani another fortress, called Tignis, still survives as a fragmentary ruin, and near Tignis the ninth century church of Shirakawan, later converted to a fortified tower, survived until the 1950s. Magazberd was captured by the Ottoman Turks in 1579. It was garrisoned by them at least until the mid 17th century, since a Persian-Ottoman treaty of 1637 stipulated that it (and other border defences) should be dismantled. Some sort of civilian settlement probably continued at Magazberd until the mid 19th century. The site is protected on three sides by vertical cliffs, and the main fortification is a short double wall defending the vulnerable northern side. 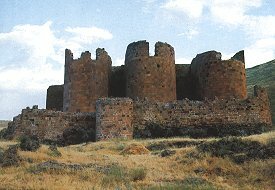 The inner wall resembles the walls of Ani. It has three tall, and very closely set, semicircular towers. It may date from the early 11th century, or from a rebuilding in the early 13th century. 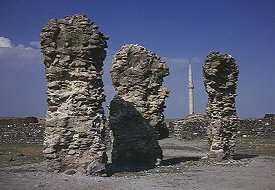 The outer wall is much lower and is probably a construction from Ottoman period: it resembles the Ottoman walls of Kars and Ardahan. Magazberd was actually a small town - inside the walls were the ruins of houses, several chapels, a palace, a cistern, and other structures. An underground passage linked the castle to an entrance beside the river. The exact current condition of Magazberd is unknown - although external views suggest that it is little changed, except that the outer entrance shown on old photographs has been destroyed. 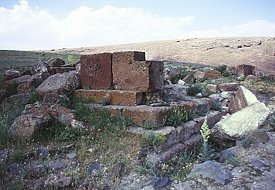 To the south of Magazberd there were formerly a number of important buildings dating from the time of the Kamsarakans - the predecessors of the Bagratid rulers of Ani. Unfortunately little has survived the last 80 years of Turkish rule. Alem (formerly called Alaman) is a village about ten kilometres to the south of Magazberd. It once had an Armenian church dedicated to Saint Anania. Nothing now remains of it - presumably it became another victim of Turkey’s policy of cultural genocide against Armenian monuments. The church was a small, domed building with a triconch plan and a rectangular entrance arm to the west. An inscription recorded its founding by Prince Grigor Eghustr and his wife Mariam in the year 637, and also named Nerseh Kamsarakan, the local ruler at that time. 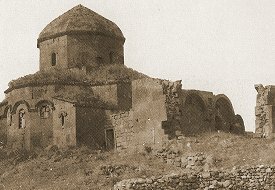 The church was in good condition in 1920 when visited by the Armenian archaeologist Ashkharbek Kalantar. 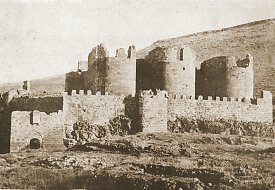 At that time Alaman had 45 houses; 23 inhabited by Armenians and 22 by Yezidi Kurds. 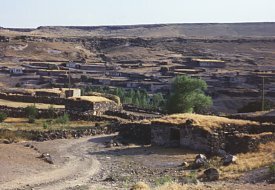 Ekrek (formerly called Agarak) is a village further to the south of Alem and a little to the south of Digor. 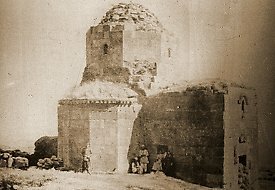 At least until the 1920s it had a domed Armenian church of an early date - today it is totally destroyed (all that is left is a few fragments of concrete). Next to it was the ruins of a single naved church - also now demolished. The domed church was called the Church of Saint Stephen the Protomartyr. 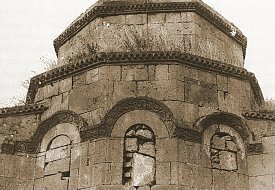 It had a quatrefoil plan with a central cupola supported on squinches. The roof was tiled, and at the apex of the dome was a spherical stone bearing a cross (pulled down by Kurds during WW1). Both the altar apse and the south apse had three large windows. A hooded cornice moulding decorated with stylised vine leaves ran around the top of the altar-apse windows, and a cornice with horseshoe arches ran around the top of the apse walls and drum of the dome. These and other features date this church stylistically to the seventh century, probably around the year 650. The small rooms on either side of the altar-apse should be noted. Their external walls are not well integrated into the overall design. This suggests that they are a later addition - yet decorative motifs on the church walls continue onto the walls of these rooms, proving them to be contemporary with the rest of the church. 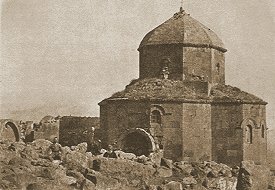 The earliest centrally planned Armenian churches were built without annex rooms, in later churches they become completely integrated into the structure of the building. In this church, the design form is seen to be still evolving. The single naved church was older than its domed neighbour, and probably dated from the fifth or sixth century. The nave ended in an unusually wide apse, and had a vaulted ceiling covered with a saddle roof. Also unusual were the twin entrance doorways in the southern facade. The archaeologist Kalantar visited Agarak in September 1920, making the last detailed description of the site. He recorded many of the inscriptions on the walls of the cruciform church, including one in Syriac. 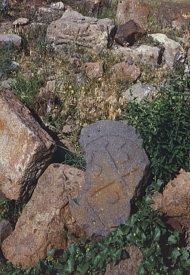 Kalantar noted numerous finely carved medieval khatchkars grouped around the churches, and in the village's Armenian cemetery where there were also several gravestones in the form of horses. There were also many architectural fragments lying around the churches, including the remains of an early medieval stele monument. This stele had carved scenes on it - including one showing a figure, perhaps a woman, holding in her hand a model of a basilica church. None of these objects now survive. 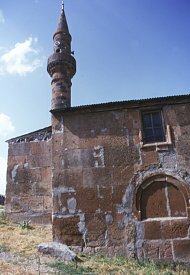 In the village of Varlı (formerly called Zipni), about eight kilometers south of Digor, there is a church that is now converted to a mosque. It was originally a domed building with a cruciform plan. By the start of the 20th century the dome has been completely destroyed - probably after an earthquake - but the structure still served as a church and had a wooden roof to replace the missing dome. Zipni at that time had 300 households, all of them Armenian. The church probably dates from the seventh century, but possibly later - perhaps the tenth century. In its conversion to a mosque the original door in the south wall has been walled up, and a new door broken through the apse wall. In a cemetery to the west of the church Kalantar noted six funereal monuments carved in the form of stone horses. Just outside Zipni there are the foundations of another church, uninvestigated and of an unknown date. It once lay within a small graveyard. 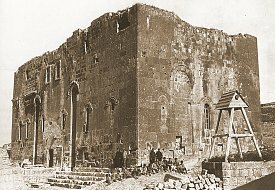 In the village of Kocaköy (formerly called Nakhijevan) there was a church, probably a basilica, that was in ruins by the start of the 20th century. Nothing now remains except bits of the concrete core of its walls. Today Kocaköy is just a small village, but it was once a small town and an important place. Close to the church was (perhaps still is) an underground structure built around the year 360 as a mausoleum for the Kamsarakan dynasty. This comprised a pair of rectangular tomb chambers built of rough stone, each about 4 metres long and oriented east-west. A short passage built of cut stone linked the chambers to the outside. The roofs of these chambers were slightly above ground level, but hidden under a low mound. In 1920 Kalantar noticed that in one chamber was a tombstone for a Prince Artavazd (this stone survived until sometime after 1964) and that there were traces of two other underground mausoleums in the village. This page [Magazberd Fortress] was first published in 1999. It was last modified on the 2nd September 2000.